Digital marketing is a very competitive field. This is especially true since it has become more of a necessity with the growth of the Internet and eCommerce. There is competition for customers, even with others in your industry. Due to this fact of our existence, an average digital marketing campaign will not be enough. 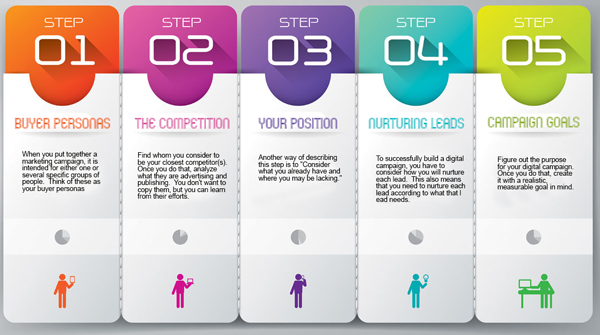 To help you out, here are five steps to creating a successful digital marketing campaign. This campaign has the objective of effectively reaching customers. Makes sense as a goal, eh? When you put together a marketing campaign, it is intended for either one or several specific groups of people. Think of these as your buyer personas, or target market. Failure to consider them at any stage in the development of your campaign can almost guarantee you won’t be successful. But, give yourself a break. If you do not understand the concept of “buyer personas” and you are not an expert today, there is still room for growth in that area and time to learn. For example, check out this HubSpot article on buyer personas, to help give you a better understanding. Another way of describing this step is to “Consider what you already have and where you may be lacking.” Another way of looking at the second half of that assessment is asking yourself, “Where do I need improvement?” If you already have content on your site, you should examine it to assess your past campaigns and which buyer personas they were targeting. This examination of content will reveal the stages of the buyer journey that you have yet to address. Again, to understand “buyer personas,” refer to the article mentioned above, which goes into more depth. To successfully build a digital campaign, you have to consider how you will nurture each lead. This also means that you need to nurture each lead according to what that lead needs. You need to guide buyers toward making a purchase. After all, we are talking ecommerce here, right? So for each campaign, think about how the campaign content will unfold over time so the buyers will make that purchase. Figure out the purpose for your digital campaign. Once you do that, create it with a realistic, measurable goal in mind. It is not necessarily easy to set goals, especially if you are unsure what to expect from a campaign, but having a measurable goal helps you keep track of your progress and allows you to refine your strategy over time. That also means that you can refine your goals over time. No one said success is easy, but it is able to be attained. In this day and age we hear a lot about the agile approach, an iterative approach. What does that mean? Really, it means 1) dig in and do something today; and 2) don’t be afraid to make improvements (changes) along the way as you find strategies that are more effective for you. So, let’s go out there and make something happen, ok? !